Prosciutto, Herb Stuffed Tomatoes, Thyme for Cooking seasonal gourmet. A little bit of good Prosciutto imparts a lot of flavor to this easy first course. You could substitute crisp, crumbled, fried bacon or chopped regular ham. Slice the tops off of the tomatoes and scoop out the center, about an inch (2.5cm) deep. Combine the ham, herbs and bread crumbs. Spoon the mixture into tomatoes, pressing it down to fit. Divide the cheese and place on top of each tomato. 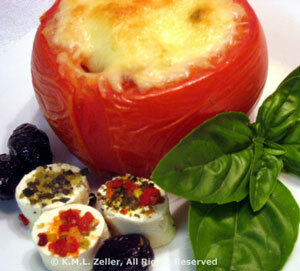 Put onto a baking sheet and bake at 400F (200C) for 15 - 20 minutes, until tomatoes are hot and cheese starts to brown. Remove and serve, garnished with whole basil leaves.